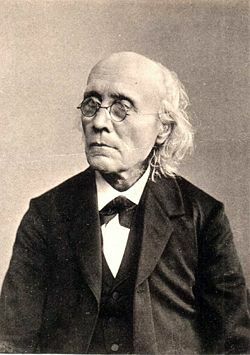 Gustav Theodor Fechner (April 19, 1801 – November 28, 1887) was a German psychologist who invented psychophysics, laying the foundation for the development of experimental psychology. Fechner's goal was to develop scientific techniques that would measure the relationship between the mental activity of the mind, and the physical behavior of the body, which he believed to be connected like two sides of the same coin. He was also interested in art and made significant contributions to our understanding of aesthetic principles. Fechner inspired many 20th century scientists and philosophers, including Ernst Mach, Wilhelm Wundt, Sigmund Freud, and G. Stanley Hall. While his founding insights have stimulated much fruitful subsequent research regarding the relation between body and mind, Fechner's particular attempts to define a precise formula relating strength of the stimulus and the strength of the sensation were highly controversial and generally rejected. Nonetheless, his place in history is secured because his work did open the door to the objective study of mental activity, a key development toward gaining psychology a place in the spectrum of scientific disciplines. Gustav Theodor Fechner was born in a small village at Gross-Särchen, Prussia (Germany). The son of a Lutheran pastor, he was taught Latin from the age of five years. His father died when he was still a young boy. Fechner attended the Gymnasium in Sorau and Dresden, and in 1817 he enrolled at the University of Leipzig, in the city where he spent the rest of his life. Fechner received his medical degree in 1822, but decided not to practice medicine. Instead, he started to write satire, under the pseudonym of Dr. Mises. Through this he criticized contemporary German society, especially its predominantly materialistic worldview. At the same time, Fechner began to study physics. In 1824 he started giving lectures, and in 1834 was appointed professor of physics at the University of Leipzig. He married in 1833. Fechner contracted an eye disorder in 1839 due to long periods he had spent staring into the sun while studying the phenomenon of after-images. After much suffering, Fechner resigned his professorship. The following period of Fechner’s life was rather grim, marked with suffering from near blindness, and thoughts about suicide. Eventually however, Fechner overcame his problems and recovered in the early 1840s. In 1844 he received a small pension from the university, which enabled him to continue to live and study on his own. In 1848 he returned to the university as a professor of philosophy. The problems with his sight led Fechner to turn toward more speculative and metaphysical studies. He started research on the mind and its relation to the body. In 1850 Fechner experienced a flash of insight about the nature of the connection between mind and body. Based on this insight he created psychophysics—the study of the relationship between stimulus intensity and subjective experience of the stimulus. In 1860 he published his great work, Elemente der Psychophysik (Elements of Psychophysics), which opened doors for him into the academic community. In the late 1860s and 1870s, however, Fechner's interest turned to the study of the aesthetic principles of art. He even conducted something that seems to have been the first public opinion poll when he invited the public to vote on which of two paintings was more beautiful. Fechner published his famous Vorschule der Aesthetik in 1876, in which he explained some basic principles of aesthetics. However, he never lost interest in research on the relationship between mind and body, and he continued his work in this area. Fechner spent the rest of his life giving public lectures, until his death in 1887. "In order that the intensity of a sensation may increase in arithmetical progression, the stimulus must increase in geometrical progression." where S stands for the sensation, R for the stimulus numerically estimated, and c for a constant that must be separately determined by experiment in each particular order of sensibility. Fechner's conclusions have been criticized on several levels, but the main critics were the “structuralists” who claimed that although stimuli are composite, sensations are not. "Every sensation," wrote William James, "presents itself as an indivisible unit; and it is quite impossible to read any clear meaning into the notion that they are masses of units combined." Still, the idea of the exact measurement of sensation has been a fruitful one, and mainly through his influence on Wilhelm Wundt, Fechner became the "father" of the "new" laboratories of psychology investigating human faculties with the aid of precise scientific apparatus. If sensations, Fechner argued, could be represented by numbers, then psychology could become an exact science, susceptible to mathematical treatment. Fechner also studied the still-mysterious perceptual illusion of "Fechner color," whereby colors are seen in a moving pattern of black and white. He published numerous papers in the fields of chemistry and physics, and translated works of Jean-Baptiste Biot and Louis-Jacques Thénard from French. A different, but essential, side of his character can be seen in his poems and humorous pieces, such as the Vergleichende Anatomie der Engel (Comparative Anatomy of Angels) (1825), written under the pseudonym of "Dr. Mises." Fechner's work in aesthetics was also important. He conducted experiments to show that certain abstract forms and proportions are naturally pleasing to our senses, and provided new illustrations of the working of aesthetic association. Although he was quite influential in his time, disciples of his general philosophy were few. His world concept was highly animistic—he felt the thrill of life everywhere, in plants, earth, stars, the total universe. He saw human beings as standing midway between the souls of plants and the souls of stars, who are angels. God, the soul of the universe, must be conceived as having an existence analogous to men. Natural laws are just the modes of the unfolding of God's perfection. In his last work, Fechner, aged but full of hope, contrasted this joyous "daylight view" of the world with the dead, dreary "night view" of materialism. Fechner's position in reference to his predecessors and contemporaries is not very sharply defined. He was remotely a disciple of Friedrich Wilhelm Joseph von Schelling, learnt much from Johann Friedrich Herbart and Christian Hermann Weisse, and decidedly rejected Georg Wilhelm Friedrich Hegel and the monadism of Rudolf Hermann Lotze. As the pioneer in psychophysics, he inspired many twentieth century scientists. Before Fechner, there was only "psychological physiology" and "philosophical psychology." Fechner’s experimental method began a whole new wave in psychology, which became the basis for experimental psychology. His techniques and methods inspired Wilhelm Wundt, who created the first scientific study of conscious experience, opening the door to the scientific study of mind. Fechner, Gustav T. 1851. Zendavesta, oder über die Dinge des Himmels und des lenseits. Fechner, Gustav T. 1853. Uber die physikalische und philosophische Atomenlehre. Fechner, Gustav T. 1876. Vorschule der Ästhetik. Fechner, Gustav T. 1879. Die Tagesansicht gegenüber der Nachtansicht. This page was last modified on 20 July 2017, at 16:26.